Who needs a Turkey when they can have an over-the-top beautiful gift basket overflowing with delicious Hickory Smoked Sausage, assorted Cheese and Crackers and other tasty treats? 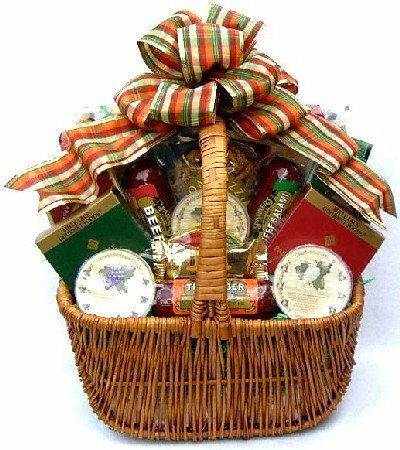 This fall gift basket is a cut above all the rest! This Extra Large cheese and sausage gift of traditional favorites includes: Hickory Smoked Beef Summer Sausage, Thuringer Summer Sausage, Beef Salami, Seasoned Pretzels, Chocolate Dipped Hazelnut Biscotti, Butter Toasted Crackers, Garlic and Herb Crackers, Original Recipe Wine-Cheese-Caviar crackers, Pepper and Poppy Wine-Cheese-Caviar crackers, Wisconsin Cheddar Cheese, Tomato and Basil Cheese, Brie Cheese Spread, Vegetable Cheese Spread, Havarti Dill Cheese Spread, Festive scarecrow cheese spreader, More Crackers, Pistachios, Hickory Smoked Almonds, Swiss Cheese, Deluxe Cashew Nut Mix, Boca Bar Cocktail Mix, Delicious mixture of Dried Fruit and Nuts, Smoked Salmon, Assorted Gourmet Dipping Mustards, Gourmet Snack Mix, Cranberry Pecan Cookies with Dark Chocoalte Bottoms, Chocolate Fudge. This extra large cheese and sausage arrangement arrives topped off with a gorgeous fall bow and is set in a beautiful and unique wicker basket! Amazing! This amazing extra large Fall gift basket holds nothing back. We loaded this one with some of the best flavors of fall and arranged them all in this basket for maximum presentation effect!